Get started with the new Automations in SalesSeek. Welcome to the new generation of Automations in SalesSeek. Get full control of all your Sales, Marketing, Customer Support and general back office workflows. In this in-depth article you'll be able to get up to speed with how to use Automations and how they can help improve your business workflows. Let's first go over the fundamentals of Automations. 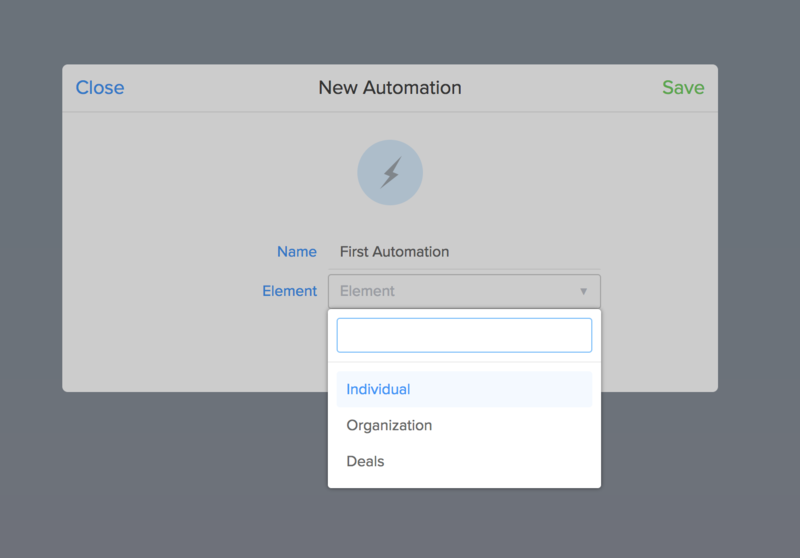 When you create a new automation you need to decide which SalesSeek record type you need to use. You have a choice of: Individuals, Organizations, and Deals. 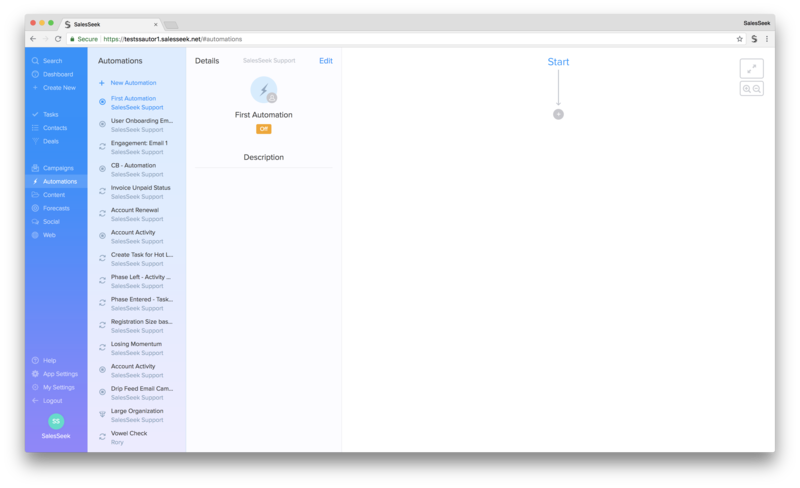 When you have selected your record type and given your new automation a name you will see the Blank Canvas. 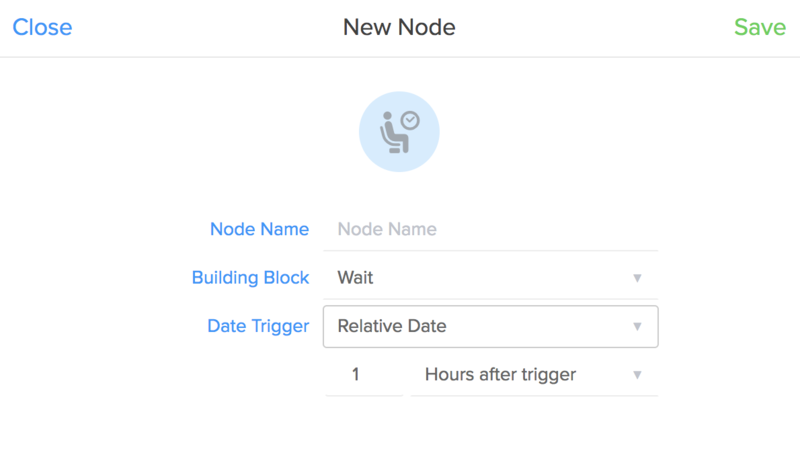 Nodes are tools or building blocks for you to use to create your Automations. Event - Events can be use to trigger automations - eg. web registration, joining or leaving a group. Merge - Reconnect branches into the the main track. Group Join - for when someone joins a specific group that you specify. Group Leave - for when someone leaves a specific group that you specify. Campaign Email Opened - to trigger an event when someone opens a specific email campaign. Campaign Email URL Clicked - to trigger an event when someone clicks on a specific email in a specific email campaign. Web Registration - providing you have SalesSeek integrated on your website's contact form, you can trigger and event when someone registers on your site. Let's explore the Actions available to us. 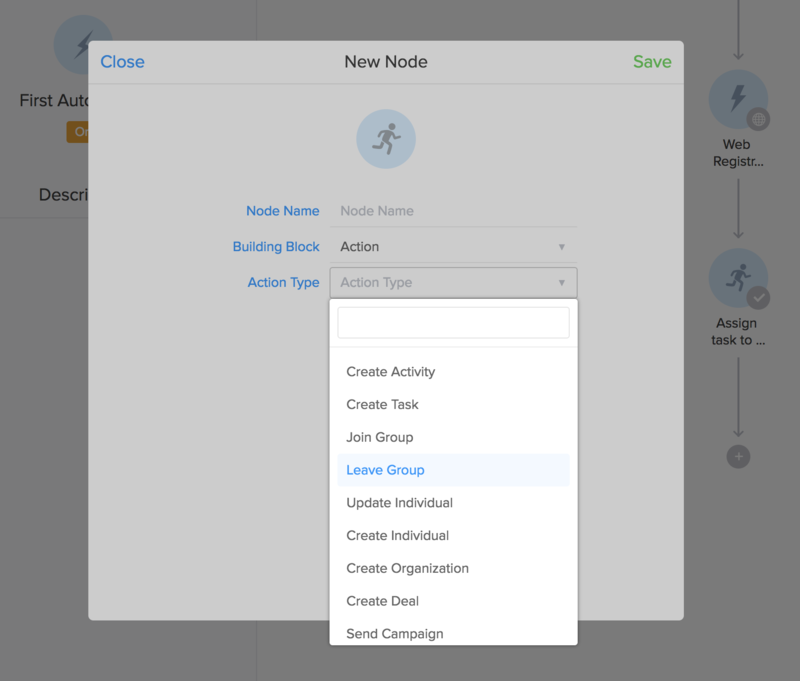 Create Activity - this will allow you to add a pre-scripted activity note to the respective record. This will be populated in the activity feed. Create Task - specify the task that you would like assigning, select a due date and an assignee. Join Group - add an individual to a group of your choosing. Leave Group - remove an individual from a group of your choosing. Update Individual - automate the update of an individual's records, such as tags, custom fields or any other relevant field. Create Individual - create a new Individual. Create Organization - create a new Organization. Create Deal - create a new Deal. 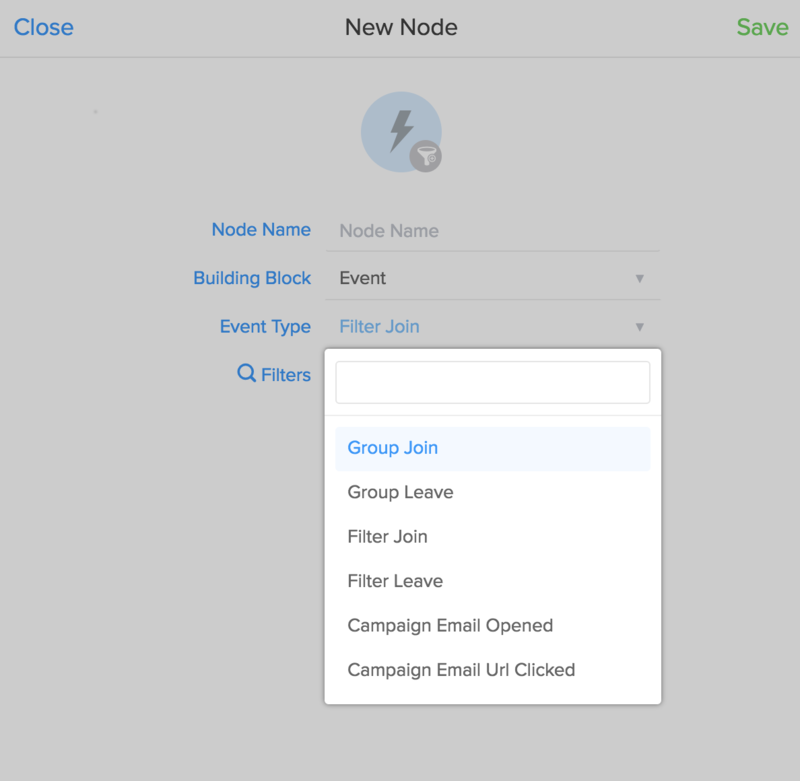 Send Campaign - trigger an Email Campaign to be sent. Wait is a simple delay tool for you to use in your Automations. You can pick a specific date, perhaps you have a concrete launch date for your new product? Alternatively, you can pick a relative date which is a selected number of seconds, minutes, hours, days, months or years from the trigger. Wait is perfect for Email Marketing automations. 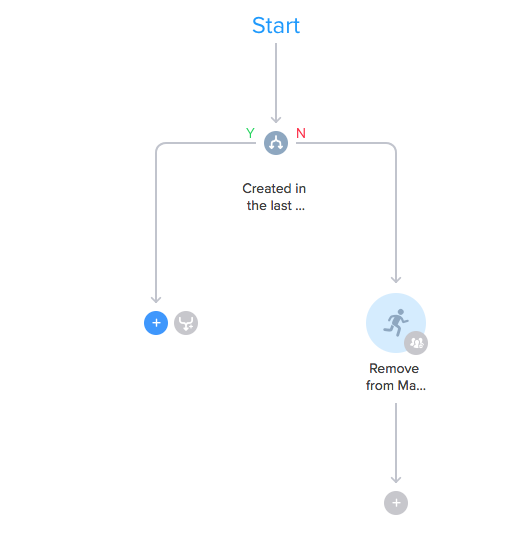 The Branch function allows you to add the familiar SalesSeek filters to any Automation, effectively splitting groups into into 'yes' and 'no' tracks or branches. For example: you may wish to segment individuals which were created within the last year, vs people who were not. You achieve this using the same filters you're already familiar with in Smart Groups. Branches allow you to tailor your automation journeys. Call is a powerful function that allows you to 'Call' other automations within your automation. Use this to build extensive and powerful full-journey automations without the complication of unruly complex journeys. The Merge tool allows you to recombine two or more branches to continue your automation.